As I previously wrote, a coffee's freshness really sells a coffee. And while the previous coffee I received from ROASTe proved flavorful despite possible age, the Tanzanian Peaberry did not fair as well. The first warning was that this coffee did not have much of a dry aroma, as when I first opened the paper bag, it smelled only like bag. I prepared the coffee in a french press, vacuum press and via drip. The press tasted sweet with tastes of Asian pear and a bit spicy with hints of cardboard. The vacuum press fared better, with a more balanced cup with similar notes of pear and spiciness. The drip produced nothing that the other two did not. 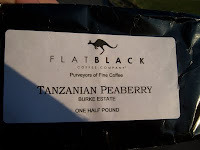 Thus, though I would say this coffee from Flat Black holds some promise, I would like to give it a try a little fresher. If you get a chance to try it, let me know how it works. Was it just stale? Or are the beans low grade arabica? Sometimes, when peaberries are separated from the lot, both lots (the peaberry and the regular) can be affected negatively. I think the coffee itself was just stale. Not only with the lack of aroma but also with the lack of head on the french press do I feel the data points to once-decent-beans gone not-as-great. From my own experience, it's very difficult to come across a good fairtrade spresso. It was certainly interesting for me to read the post. Thanks for it. I like such topics and everything that is connected to them. I would like to read a bit more soon.